Let’s begin with a shortcut. Who doesn’t like shortcuts? If you prefer convenience, you can easily pick up premade spice packages at Chinese grocers such as the one on the left here. The pouches look like teabags and you simply steep your broth following package directions. I snipped one open and you can see an assortment of broken fragments of whole spice. Each brand would use their own unique blend of spices and I recommend that you read the boxes carefully. 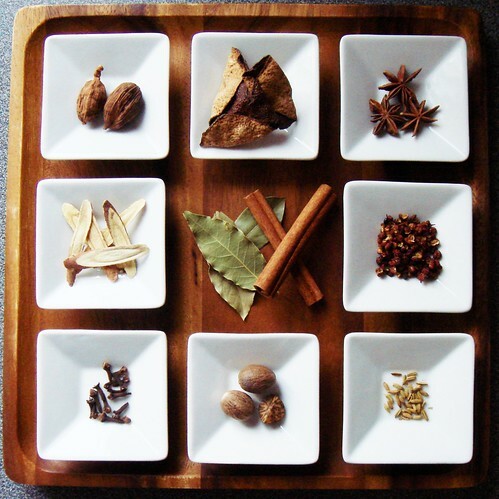 You will likely find popular ingredients such as star anise, fennel seed, nutmeg, cinnamon, black peppercorn, and bay leaf. Doesn’t sound so alien now, right? But of course, the complexity of the broth is determined by the blend of spices that you use. Here are the ones that will go into mine with Chinese and common English names. Feel free to print it out and bring it with you to the store! I first begin with a trio that likely requires trip to a well-stocked Chinese grocer or, better yet, Chinese herbalist & dried goods store. 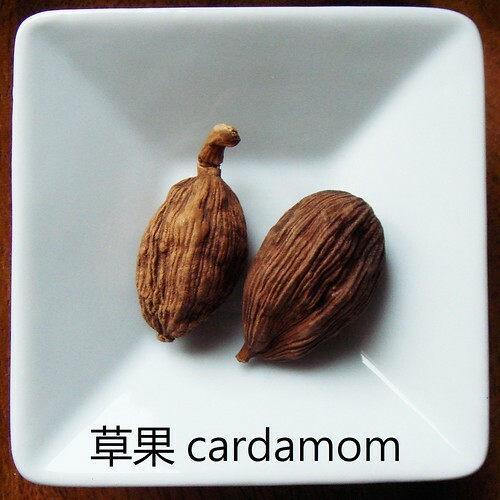 草果 cardamom is about the size of an unshelled almond. Even though the common English name is cardamom, do not mistaken it with the tiny green or black ones used in Indian cuisine. The flavour is very different. The herbalist informed me that they are great for lamb stew, something that I have yet to try. 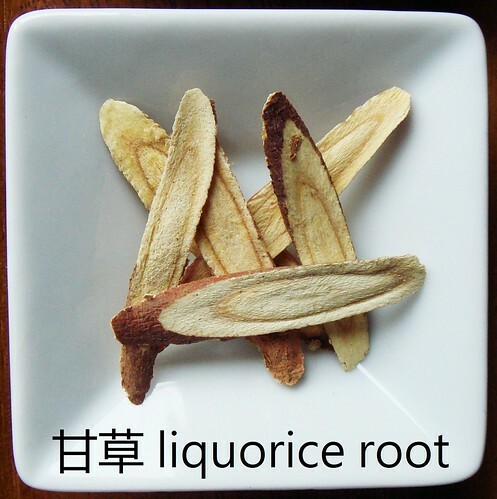 At the herbalist, I also picked up a small packet of 甘草 liquorice root. The dried shaving adds sweetness and it is often used to brew medicinal herbal tea. In a pinch, you can substitute with anise seed or other liquorice-like spices with some added sugar. 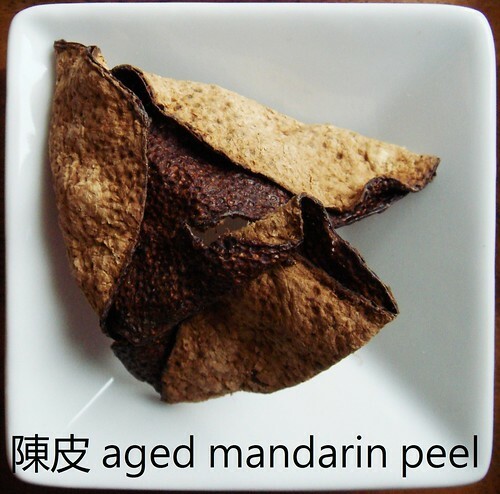 Last of the “uniquely Chinese” trio is 陳皮 aged mandarin peel. It is a very common ingredient in Cantonese cuisine for both sweet and savoury dishes. As you would expect, it adds a hint of citrus and so much more. The price varies a lot depending on how long it’s been sitting around. The store I visited offer three different grades and I picked the middle. No point in wasting the really good stuff since the broth is so busy with other flavours. For me, I associate aged mandarin peel with my grandparents. I remember visiting their homes in Hong Kong and there were always coat hangers loaded with mandarin peels in various stages of drying. Without fail, they showed up in the most unexpected places in the apartment…or just the most drafty corner. 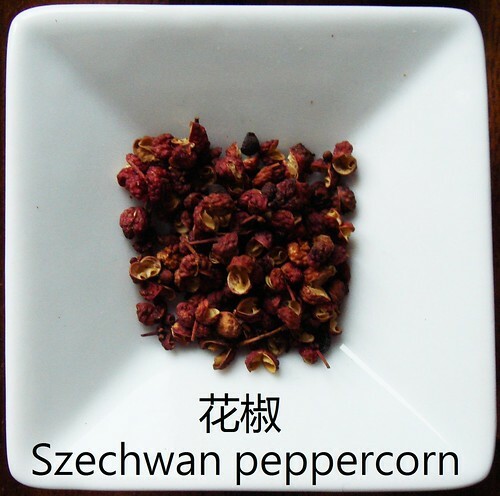 The last few years 花椒 Szechwan peppercorn garnered much Western attention and they are no longer hard to find. You can get them at a premium from boutiques like Penzey’s or you can get a huge bag for a dollar at the Chinese grocer. 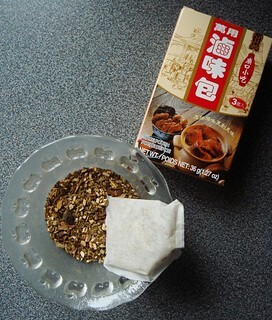 The unique numbing sensation is much prized in Szechwan cuisine. If you are a fan of spicy food, I highly recommend that you include this ingredient in your pantry. 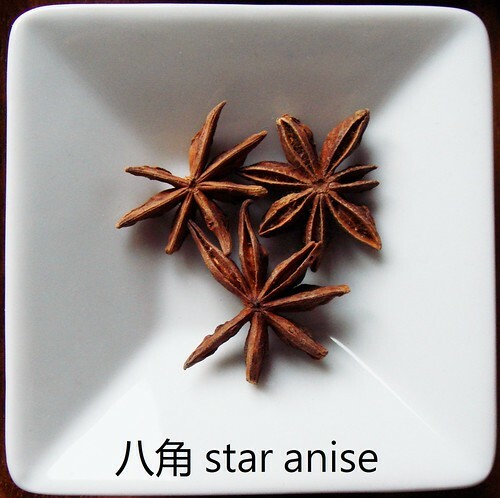 Once upon a time, 八角 star anise was considered exotic. Isn’t it great that those days are behind us now? You can buy star anise at most supermarket nowadays. I love to make chai tea or wine poached fruit with this spice. If you haven’t gotten the drift yet, liquorice is a major flavour profile in the bouquet garni. 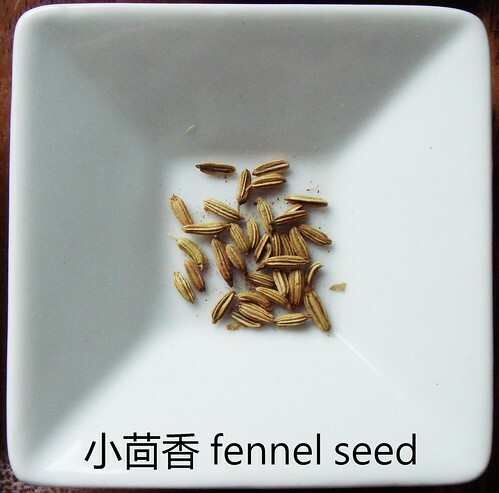 小茴香 fennel seed is often included. You probably have some lying around in your pantry. I like to think of the following three players as Gingerbread Spice. 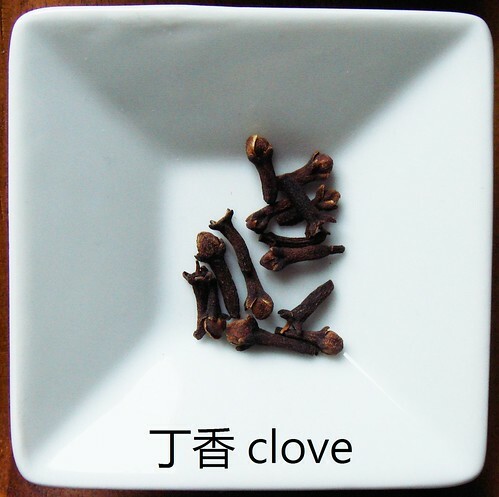 丁香 clove is often used after it’s been ground. Whole clove should be familiar if you ever look at photos of retro glazed ham. Did you drink any eggnog last month with grated nutmeg sprinkled over the mug? Sure you did. 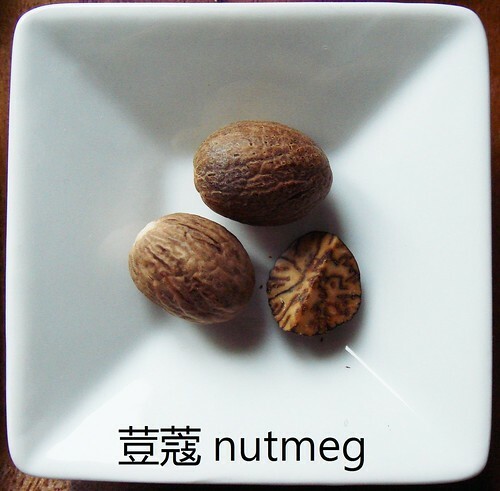 Find that nub of 荳蔻 nutmeg now. I sure hope you didn’t use the old dusty stuff that you shake out of a bottle. 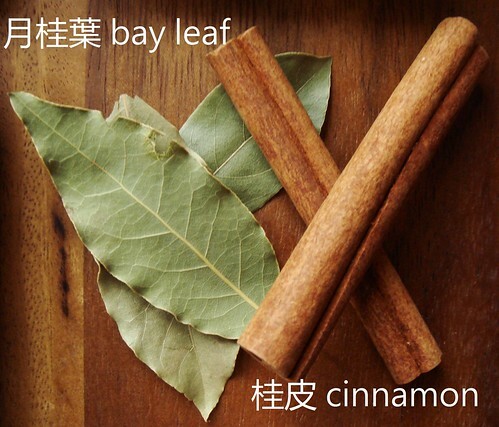 Last but not least, 月桂葉 bay leaf and 桂皮 cinnamon bark. If you haven’t heard of these two, hmm, just buy the premade spice packages and call it a day. You’ll be much happier. Come back next week and I’ll show you the recipe for my soon-to-be heirloom marinade and all the goodies I will make with it!